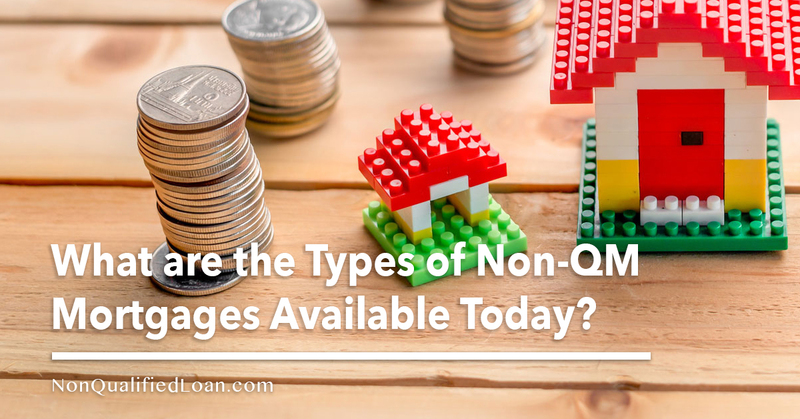 What are the Types of Non-QM Mortgages Available Today? Mortgages today are classified into two categories: qualified, and non-qualified. Qualified mortgages are designed to cater to individuals who can fully demonstrate their ability to pay back a loan. But a significant part of the American population does not fall within this category. Most businessmen or self-employed individuals, as well as freelancers or those who do not receive a steady stream of income may find it hard to qualify. This is where non-qualified mortgages come in handy. Non-qualified mortgages (Non-QM) come in different forms, and target a different segment of the housing market. Let’s look into its variety. With interest-only loans, you pay only the interest on the loan for a specified period. After this period expires, you are then liable to pay for the interest AND the principal, which could cause your monthly payments to balloon. If you are going to take this type of loan, be sure that you are well-prepared and have money to tap into by the time the interest-only period comes to an end. Investment properties are treated by the housing industry as business. Hence, loans for these properties do not have to abide by the rules set by the Dodd-Frank Act. This secures the variety of the type of financing an investor or borrower can get. Different lenders may have different sets of qualification guidelines for potential borrowers. Need financing for investment properties? We can help. Banks offer big loans for individuals whose net worth are significantly high. These individuals usually do not have a consistent income but do have a significant number of assets on their name. Thus, many banks offer loans that are based on assets rather than income. These assets must be verified (in lieu of the income) in order to qualify for the loan. These asset-based loans typically loan thousands of dollars or even millions to qualified individuals. However, borrowers must be able to maintain excellent credit and put a good percentage of the loan amount as down payment. Conventional, qualified mortgage lenders will deny your loan application if your debt-to-income ratio goes beyond the 43 percent limit. This poses a problem if you are receiving irregular income or are purchasing a property with a high loan amount. Thus comes non-agency mortgage programs to your aid. Through a non-agency mortgage, you can get around the 43 percent DTI cap and secure financing for your home. However, you must be able to demonstrate to the lender that you will be able to pay back the loan. Do not take a mortgage that is more than you can afford. Make an honest evaluation of your income and prepare to deliver. If you are having difficulty documenting your income, but need a home loan, you can opt for stated income loans. These types of loans target self-employed individuals. For stated-income mortgages, lenders do not look at your pay stubs and W2 forms as well as your income tax records. You just need to state your income and they take your word for it. Because of this, stated income loans are deemed risky and most of them has been eliminated especially after the housing crisis hit in 2008. However, there are still versions of stated income loans that exist. One of these are asset-verified loans. Compared to some of its predecessors, they have stricter guidelines and qualification requirements. To get asset verified loans, your asset must be reflective of your income. Moreover, you must have money on your account that is enough to cover the loan expenses should something disrupt your income flow. Qualifications depend from one lender to another. But one thing is made sure: that you can afford to pay for the loan despite vague income records, and that you will be able to pay back what you owe. If you are looking for financing but do not fit the traditional eligibility and qualification standards required by lenders, non-qualified mortgages could be your saving grace. However, these loans are risky and there are frauds who are always ready to pounce on the unsuspecting. When you head out shopping, make a criteria for your lender, and always be on the lookout for non-credible transactions. Find a Non-QM lender near your area today.